Upper-floor rooms can be difficult to heat and cool. Sometimes the difficulty is caused by leaky joints, ducts or even the layout of a home. If a heater or air conditioning unit sits in a basement and is separated from an upstairs bedroom by a garage, attic and/or crawl space, air can get lost in those areas along the way, reducing the amount of cool air that makes it to the upstairs room. In addition to checking your duct work and sealing any visible leaks or cracks with duct tape, you can use dampers to divert cold air to upstairs rooms, making them cooler when it's hot outside. 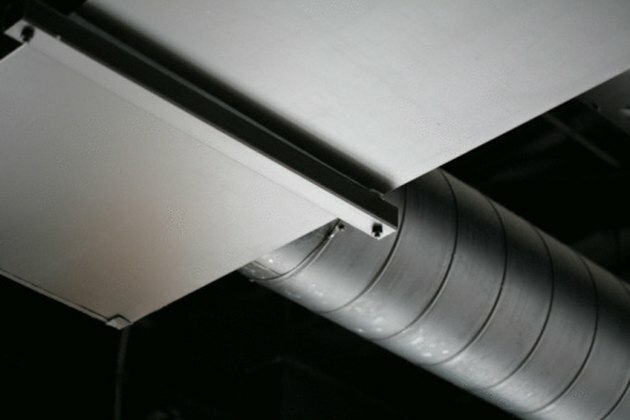 Checking your duct work is the first step in adjusting your air conditioning. Examine your air ducts with a flashlight. Find the spot where secondary ducts branch off from the main duct running from the furnace and air conditioner. Start at the furnace and follow the duct work until you find the spot where additional ducts branch off at 90-degree angles from the main duct work. Look closely at the bottom of the air duct to see if your duct work has secondary balancing dampers, which look like small levers. Notice the angle of the lever and understand that it indicates the direction of the air flow through the duct. Adjust the lever so air is redirected toward the area or room(s) in the upper part of your home that you want to make cooler. Wait a few days to determine if the changes you have made satisfy your need for colder air in certain upstairs rooms. Adjust registers throughout the house if you don't have balancing dampers on your duct work, or if the changes you made don't create the desired effect. Identify the room or portion of the upstairs that you want to direct more air conditioned air into. Move to the lower floor of the home in the rooms or area directly beneath the upstairs portion you want to cool. Locate floor and ceiling registers in those rooms and close them, understanding that this action will cut off or reduce the supply of cold air to these bottom-floor rooms and redirect it toward the upper-floor rooms. Close the registers by moving the knob-like dial to the right or left of the in-ceiling or in-floor vent with your thumb so the flaps beneath the grate shut halfway or entirely.